I perused the aisles of my local pharmacy last week with a friend, stopping at the Barry M stand, as per usual. This range of polishes caught my eye. Their website describes them as: “Hi shine Gel effect Nail Paint [that] provides an extra glossy finish”. I mean, who can turn that down? Except. Except, well, it’s awful. I invested in the colour above, Key Lime, as I can’t turn down a bright varnish. My friend told me, she told me that they were awful but would I listen? Hardly. The varnish goes on lumpy, with bubbles forming in the varnish. It takes about eighteen hours to dry (that’s an exaggeration but you know what I mean) and when it does finally manage to dry, it’s too thick and scrapes off easily. Yeah, it’s cheap enough, so you shouldn’t expect much. But, for me, it’s a pity since I have other varnishes in this brand and they’re pretty good, in fairness. Really disappointed this time around. Verdict: Please, for the love of god, don’t buy this. 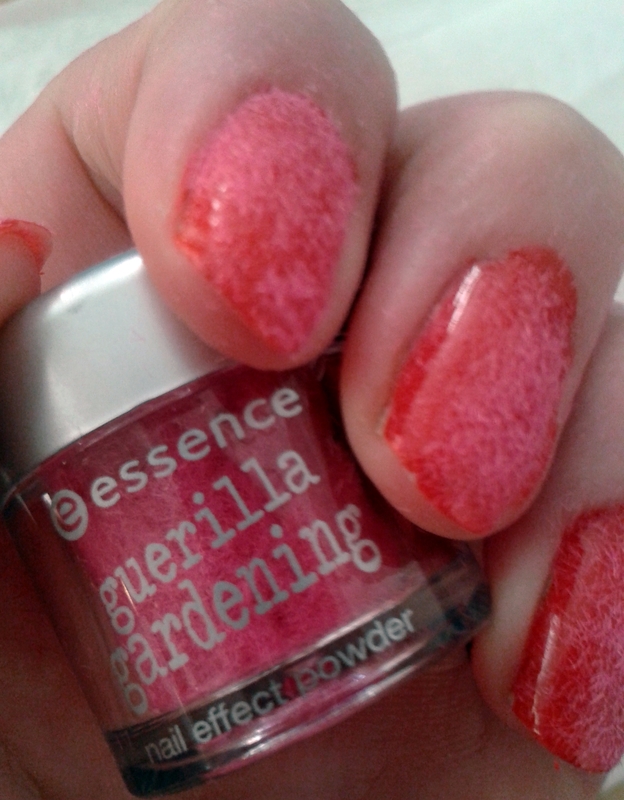 To celebrate the summer season (I’m a bit late with this, many apologies), in May the budget friendly make-up brand, Essence, launched their limited edition Guerilla Gardening Collection. Presumably they were following the logic that even if one isn’t the most green-fingered of individuals, they can always mimic the sentiment of doing a nice spot of gardening in summer through the medium of make-up. As someone who is absolutely useless at gardening that is also a sucker for affordable make up, I appreciate their efforts. 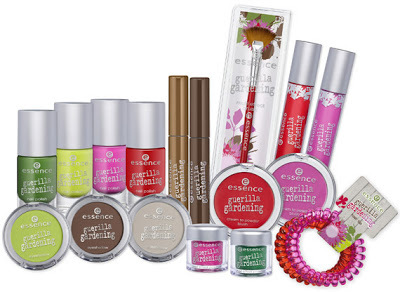 The collection includes a multi effect nail brush, eye shadows, cream to powder blushes, brow gels, lip creams, nail varnishes and velvet nail effect powders in a variety of earthy and bright shades, you know –colours that scream BOTANY. Feeling spoilt for choice at my local Essence stand; I decided my nails were in dire need of a summer makeover. I ended up purchasing a nail polish in Floral Glam, the nail effect powder in Mission Flower and also the multi effect nail brush. You’re probably wondering if they’re any use. The answer to that would be that they’re fine. They’re absolutely fine, if a bit gimmicky. 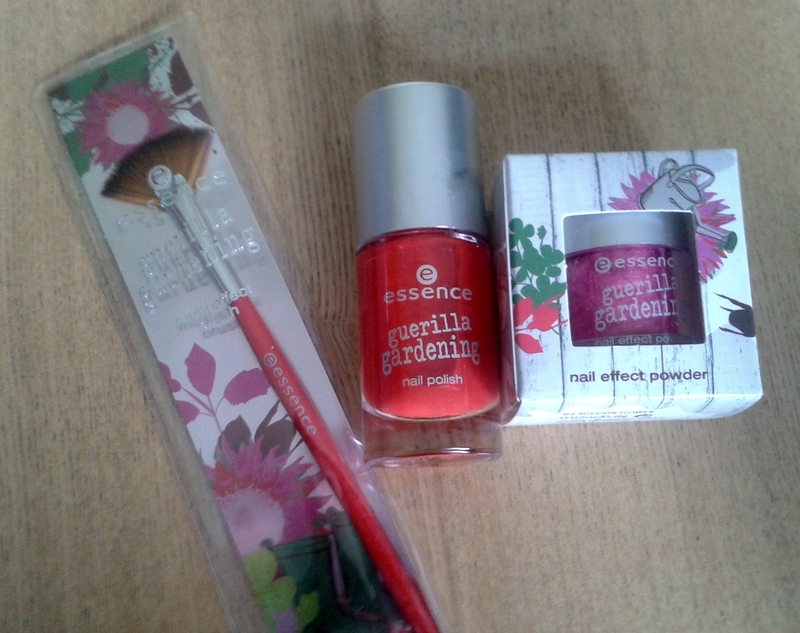 I’ve long been a fan of the Essence nail polishes, they’re cheap as chips, good quality and available in a variety of colours, so adding a tomato red shade to my collection was a nice treat. I’ve always been a bit sceptical about velvet textured nail powders, so this was my first time venturing into the world of fluffy nails. Honestly, I wasn’t too impressed. As per the instructions, I sprinkled the powder onto my nails while the nail varnish was still wet. Following that, I removed the excess powder using the nail brush. My nails dried and they looked red and pink and furry – for about an hour. I didn’t even need to wash my hands for the powder to come off. Within a few hours my nails were basically red again, albeit slightly textured. The nail brush was just plain unnecessary, the excess nail powder easily fell off my nails, rendering the fan shaped brush pointless. Had I paid more for the products I would be quite annoyed. However, since I bought everything for less than ten euro, I won’t be spending too many sleepless nights lamenting my purchase. If you’re at all tempted by the nail products in this collection, my advice would be to bypass the gimmicky stuff and stick with some good old fashioned nail polish.